The primitive, hair-like feathers known as protofeathers likely belonged to theropods — dinosaurs similar to tiny Tyrannosaurus rexes — that roamed the swampy forests of Alberta 80 million years ago, said Alexander P. Wolfe, a University of Alberta earth sciences professor who co-authored the research published Thursday in Science. "Protofeathers aren't known from any modern, existing groups of birds and therefore the most obvious interpretation is that they belong to dinosaurs," he said. Theropods, which are thought to be closely related to modern birds, were already known to have feathers, based on features surrounding fossils found in China. But a lot of details were lost in the fossilization process. "The feathers get altered, they get substituted by minerals and you can't see any of the detail," Wolfe said. The protofeathers may look very hair-like, but the researchers confirmed they were feathers by looking at them under a microscope, Wolfe said. Hair, found on mammals, has microscopic scales. Feathers, found in birds and dinosaurs, have features called nodes and internodes instead. "With amber, it's different. We actually have the actual object.… we actually have this protofeather for the first time in the flesh." The feathers are preserved down to the pigments that show what colour they are and microscopic details of their structure. Based on the fact that the protofeathers were just single filaments or clumps of filaments, just two centimetres long, the researchers concluded "these had nothing to do with flight," Wolfe said. Instead, he believes they were used to keep the dinosaurs warm. 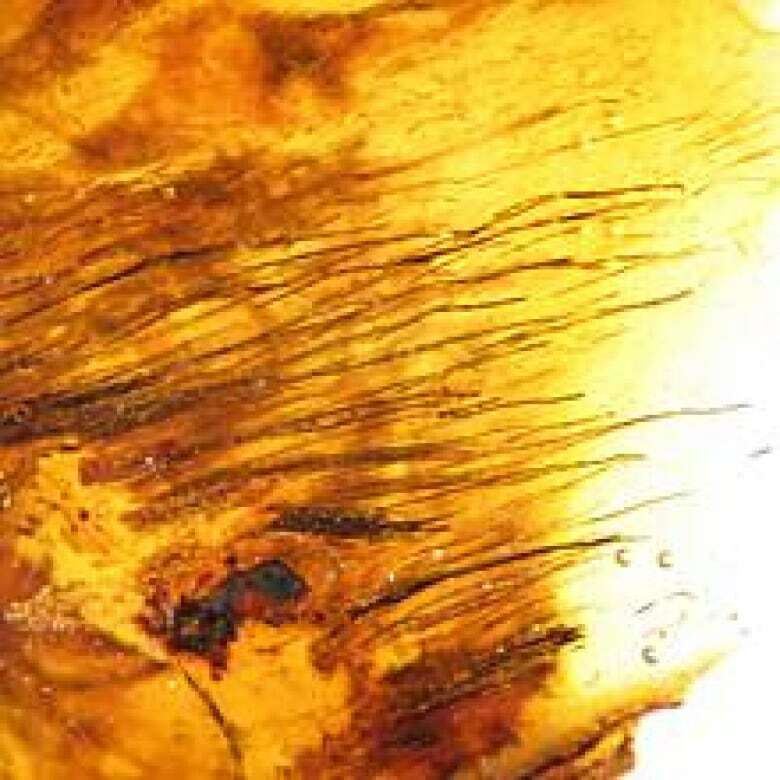 The protofeathers were among a wide range of feathers found in Alberta amber specimens by Ryan McKellar, a researcher who recently completed his PhD under Wolfe's supervision. McKellar's research was initially interested in insects, but stumbled upon some very bird-like feathers in the process of sorting through amber from the Royal Tyrell Museum and the University of Alberta's collection, Wolfe said. He decided to keep an eye out for other feathers. After sorting through around 4,000 chunks of amber, each less than two centimetres in diameter, he had collected a wide range, from the protofeathers to more complex feathers from the same time period that were most certainly from birds. Some were downy "like the kind you have in your pillow," Wolfe said. Others look like modern flight feathers. Some also had special features found in diving birds such as grebes. Wolfe, an expert in amber chemistry, said such birds likely shared the same ecosystem as the dinosaurs — a steamy, "very buggy" coastal forest similar to Florida's everglades, dominated by cypress and cedar-like trees. The remains of the forest were compressed into coal deposits in Alberta where the amber samples were found. Wolfe said now that the new research, including photographs, has been published, he hopes researchers in other parts of the world where feather dinosaur fossils have been found will start keeping an eye out for dinosaur feathers in amber. He also hopes to do a biochemical analysis on the proteins in the feathers.